It is troubling when I find myself agreeing strongly with a view expressed in the all too often reactionary Spectator. But Damian Thompson's totally justified castigation of the Southbank Centre's forthcoming Belief and Beyond Belief festival - "This is a missed opportunity on an epic scale" - echoes my view. The fashionably themed concerts, which are billed as "a festival of music inspired by spiritual belief", are presented in collaboration with the London Philharmonic and run from January to June 2017. They include two Mahler symphonies, two Bruckner symphonies and that ubiquitous expression of joyful fuzzy spirituality Beethoven's Ninth. As Damian Thompson observes: "As for the concerts, they look suspiciously like the programmes the LPO was planning to perform anyway, before they had the three-Bs label slapped on them.."
As is the vogue, the warhorses gallop alongside contemporary music including commissions and premieres from Aaron Jay Kernis and Magnus Lindberg. In Damian Thompson's view "Belief and Beyond Belief reeks of Scriabinesque condescension." That condescension is very evidence in the programming which applies the all too familiar formula of juxtaposing new and very familiar music in the same concert. Yes, these 'front half hyena, back half koala' concerts may attract sizeable short term audiences that are prepared to sit through a Magnus Lindberg premiere for the reward of Beethoven's Ninth. But is there any hard evidence that this hyena/koala format, which inevitably fails to satisfy either neophyte or nerd, builds the much more important long term audiences? The Southbank Centre argue there is, but I question their argument. Belief and Beyond Belief is the brainchild of Southbank Centre director, Jude Kelly. She received justified praise for masterminding the Southbank Centre's acclaimed Rest is Noise festival in 2013. Few dare criticise Jude Kelly because she is one of the elite group of power brokers that controls classical music in Britain. But that will not stop me from proffering the view that Belief and Beyond Belief is no more than a muddle-headed attempt to repeat the success of The Rest is Noise. Let me give an example of that muddle-headedness. On the Belief and Beyond Belief website there is a seminar on Jan 28 titled 'What you need to know: Shostakovich Symphony No.5 In Depth'. We will overlook that the tension between Shostakovich and Stalin must be one of the most overexposed backstories in classical music, and also overlook that this seminar sounds suspiciously like The Rest is Noise reheated. My point is that in the Beyond Belief festival there is not a performance of performance of Shostakovich's Fifth. But it gets even worse, because the day after the seminar there is a performance of the symphony at the Southbank Centre. But it is not part of the festival; presumably because the orchestra is the St Petersburg Philharmonic, and as Beyond Belief is an LPO party they don't want another orchestra gatecrashing it. All this muddle-headness is exacerbated by a Southbank Centre website which is generously larded with platitudes but is painfully hard to navigate. Which means a a website visitor seeing details of the Shostakovich 5 event is very likely to leave without ever finding out that the next day there is a performance of the symphony; because there is no link from the talk to the symphony. However the same confused visitor may stumble across another Shostakovich symphony that is part of Beyond Belief; because the composer's Fifteenth Symphony does make the cut into the festival, presumably because it is played by the LPO. But let's stop playing hunt the Shostakovich; because there is the far more important question of how inclusive should a a festival of music inspired by spiritual belief be? A recent post here commented on how the classical industry refuses to even contemplate any sacred music from beyond the Judeo-Christian tradition, and, as Belief and Beyond confirms, that proscription extends effectively to all music outside the mainstream Western tradition. 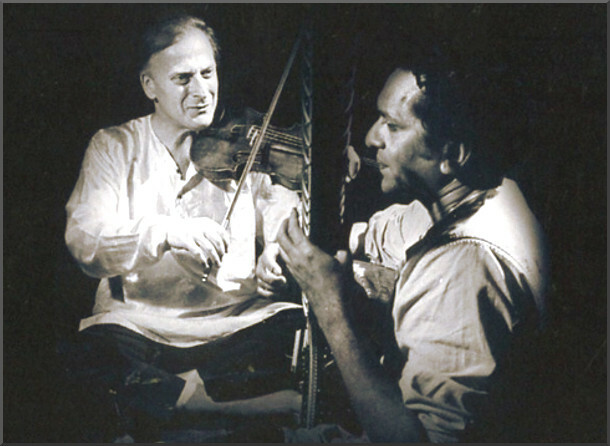 The photo above shows Ravi Shankar performing with Yehudi Menuhin, and the sitar master's recorded legacy for EMI also includes collaborations with percussionist Terence Emery (who worked with Pierre Boulez), flautist Jean Pierre-Rampal (who had works composed for him by Boulez* and André Jolivet), and conductors Lorin Maazel and André Previn. 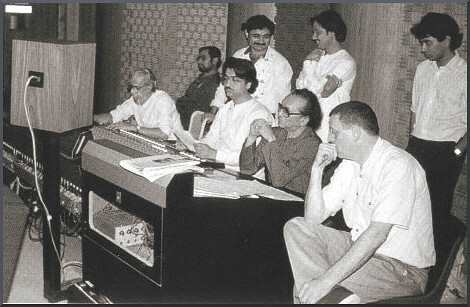 Pandit Shankar also collaborated with Philip Glass on a project released by Atlantic (in the photo below Philip Glass is nearest the camera with Shankar next to him), and Shankar's valedictory Symphony was premiered in 2010 by, ironically, the London Philharmonic Orchestra with daughter Anoushkar playing the sitar obbligato. If Belief and Beyond Belief really is a festival of music inspired by spiritual belief, why is music from beyond the Judeo-Christian tradition not included? Yes, the Southbank Centre does have notable separate mini-festivals of non-Western music. But by forcing music - and therefore audiences - into hermetically sealed genre boxes, musical boundaries are being built not demolished. Classical music needs wider as well as younger audiences, and another music festival has shown very successfully how the definition of spiritual belief can be - in fact should be - widened in our multi-faith age. In 2012 the Salzburg Summer Festival launched its Ouverture Spirituelle; each year this trans-cultural sub-festival brings together sacred music from Christianity and one of the other great perennial traditions, notably Islam in 2014 and Hinduism in 2015. Ravi Shankar once explained "I have always had an instinct for doing new things. Call it good or bad, I love to experiment", and his experiments attracted new audiences in the 1960s and 70s. Today, acclaimed interpreters of Mahler and Shostakovich abound, but classical music struggles. Do any of today's celebrity musicians love to do new things and experiment? Are classical music's problems really due to changing demographics, reduced funding and the other alleged culprits? Is it not a case of musician heal thyself? * Boulez's 1946 Sonatine was dedicated to Rampal; but he never performed it as he found it too avant-garde. Header photo is via France Musique. Any copyrighted material is included as "fair use" for critical analysis only, and will be removed at the request of copyright owner(s). Also on Facebook and Twitter.